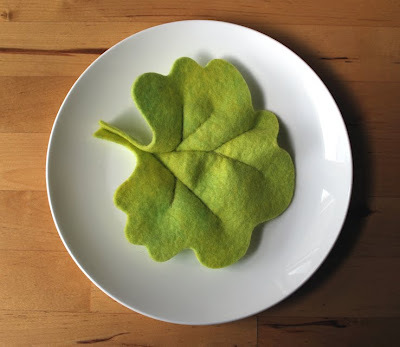 I didn’t use a pattern – it was a fun, easy throw-together with a cut-up piece of foam, hand-dyed, 100% wool felt (just feels so much lovelier than the alternative) and some therapeutic hand stitchery. If you would like the recipe, pop by in a day or two and I’ll have it posted on the sidebar. Utterly gorgeous! Best ever bakery you've got there. wow! and you just 'winged' it?! imrpessive, to say the least. You are a clever crafter! Faaaaaabulous, I adore the lettuce leaf & the tomato slices. So, so clever. That is SO. CUTE. And no calories! YUM!!! i have never seen a better looking sandwich!!!! Be still my beating heart. You are absolutely amazing. Oh, this is ingenious. I love it! And now I am feeling ravenous. Must go and eat something. I started making Punky a sandwich, oh, I don't know... 6 weeks ago...?! I've gotten as far as one finished slice of bread & the makings of another... no sign of the filling any time soon either! Love it - and I am sure Gina's boys will too. 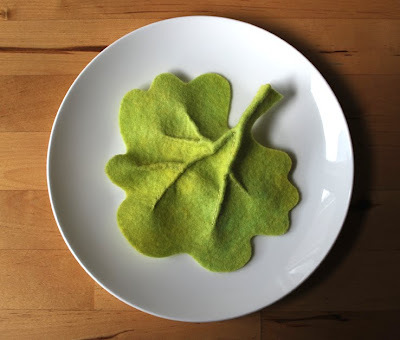 I made some felt food recently and it is a huge hit, though I wish the inhouse restaurant would serve me something other than bacon and eggs! I have a weakness for felt food, but the perfect crust on your bread and the veiny lettuce leaf is just gorgeous! 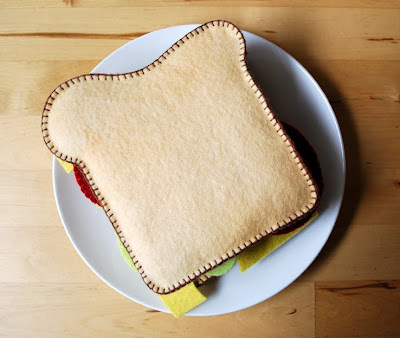 I never knew a sandwich could be so pretty! Oh this takes delicious to a whole new level! That is divine Tania! Love the lettuce ... and the tomato .. the whole lot really! I'm thinking S@C baby.I'll fly down just to get some of them! I don't think it can be said enough- that lettuce is awesome. I would be interested to see what my kids would do with this lovely sandwich- they each steer clear of tomato and lettuce in real life. Perhaps it would be good desensitization therapy? That's ace! 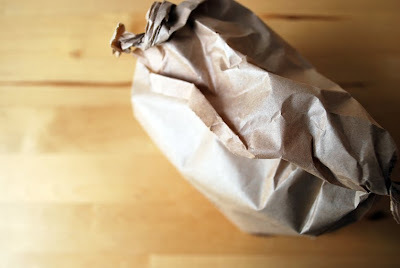 You've invented the school lunch that you can make 6 months ahead and won't squash in the school bag. The detail all looks amazing - you're very clever! ok... now my foam/ felt camera looks a bit pathetic...! i love it! that is so lovely, you did a great job. now, whats for dessert? I LOVE it!!! Gee your smart!! I'm more a breakfast person .I'd like a couple of Weetabix and a soft-boiled egg , please . This is quite awesome Tania. About as many nutrients as the real thing, these days.You should make an installation where you get a cafe to serve them to people for a day. Tania, this is the best sandwich ever. I am sure Gina will love it! Careful it look so real you may find the little one could try and put it in their mouth! That looks so real...the lettuce is amazing! That is really clever and witty - Gina will love it! what a marvel you are...the sequence of images had me smiling...so realistic! Oh That lettuce is amazing - the whole thing is but teh lettuce takes my breath away!!! Absolutely stunning. You are very clever. very cool! thank you for the inspiration, just in time for the holidays! AMAZING, I am just drooling! My fave is the piece of cheese - genius! Now that I've had a good look myself, I agree with Fi. Make kits and sell 'em!!! 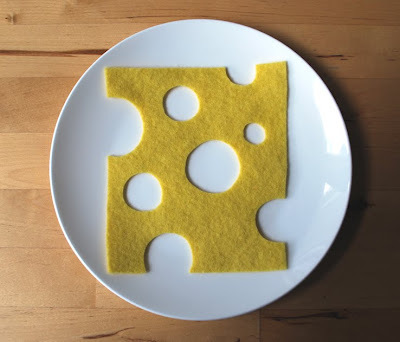 I do love me some felt food! ah! your sandwich looks ace! Wow Tania - you have raised the bar on felt food!! The lettuce is especially awesome. Oh dear, now I feel hungry! Just toooo realistic Tania, amazing! 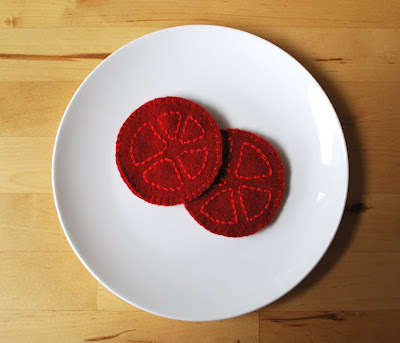 Lately, I've been stitching up some felt food for Levi. It's really such fun, and for the most part easy to do pattern free. I love yours...especially the lettuce...the veining makes it very nice. Where do you get your wool felt? Fantastic! Love the lettuce. :-) A comrade felt food-y! I love your sandwich it is fantastic. Bread, cheese, tomato and the lettuce is so cool. You never cease to amaze me the things you come up with. Thanks very much for sharing this tutorial! 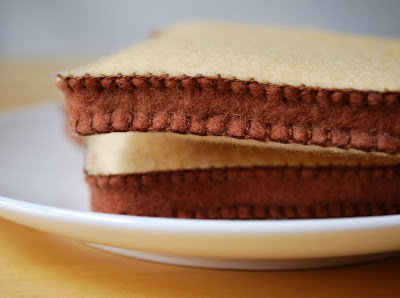 I am definitely making this soon! (Found you via whipup this morning). Fantastic! I'll post it on my blog. Hope have no problem. I made one! Such a great project! this. is. amazing! 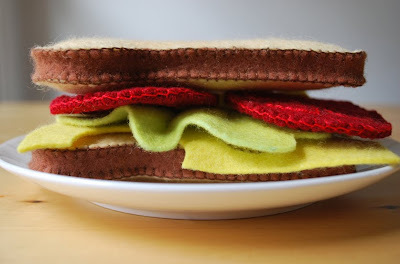 i have major sandwich and blanket stitch envy. Oh this sandwich is so nice, I have to say I love it! Thanks for the idea!